While our competitors are busy creating new bells and whistles that most computer users will never need or use, we continue to focus on developing a trusted anti-spyware product that is designed for real people! 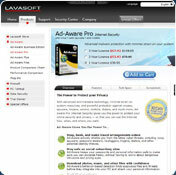 Ad-Aware Free continues the Lavasoft tradition and spirit by providing a no-strings-attached, full powered free anti-spyware product that is safe, thorough, and easy to use. This new version, boasting improved threat detection and usability features, reinforces why computer users continue to put their trust in Ad-Aware more than any other anti-spyware program. Protect the private information on your computer with Ad-Aware, the original and most trusted anti-spyware program that thoroughly detects and removes both known and emerging malicious threats. Surf the Internet with peace of mind and let Ad-Aware shield you from dangerous intruders and prying eyes. Preserve your computer investment with regular scans to identify and remove malicious applications that eat up memory and steal bandwidth so your computer runs as smoothly as the first day you bought it. Ad-Aware Free's on demand scans detect and remove spyware and other forms of malware. You cannot download any crack or serial number for Ad-Aware - Anniversary Edition on this page. Every software that you are able to download on our site is legal. There is no crack, serial number, hack or activation key for Ad-Aware - Anniversary Edition present here. Our collection also doesn't contain any keygens, because keygen programs are being used in illegal ways which we do not support. All software that you can find here is freely downloadable and legal. Ad-Aware - Anniversary Edition installation package is prepared to be downloaded from our fast download servers. It is checked for possible viruses and is proven to be 100% clean and safe. Various leading antiviruses have been used to test Ad-Aware - Anniversary Edition, if it contains any viruses. No infections have been found and downloading Ad-Aware - Anniversary Edition is completelly problem free because of that reason. Our experts on malware detection tested Ad-Aware - Anniversary Edition with various spyware and malware detection programs, including fyxm.net custom malware and spyware detection, and absolutelly no malware or spyware was found in Ad-Aware - Anniversary Edition. All software that you can find on our servers, including Ad-Aware - Anniversary Edition, is either freeware, shareware or open-source, some of the software packages are demo, trial or patch versions and if possible (public domain licence), we also host official full versions of software. Because we want to be one of the fastest download sites on the web, we host all the software including Ad-Aware - Anniversary Edition on our servers. You cannot find here any torrents or download links that would lead you to dangerous sites. Rate Ad-Aware - Anniversary Edition 8.0.5!